In 1988, Australia’s parliamentarians and their staff said their final farewells to the building that had been their home for over sixty years and prepared to move into the new Parliament House. In the weeks leading up to the move, House of Representatives Staffer Robert MacFarlane roamed up and down the halls, capturing hundreds of photos of the building and its staff at work and in their down time. Known as the Last Moments collection, these photos offer a unique window into the daily workings of Old Parliament House in the late eighties. I had the chance to get up close and personal with this special collection during my internship at MoAD last year, when I was given the job of digitising the Last Moments photos. Working through the collection, I found myself drawn into a curious behind-the-scenes tour through bustling kitchens and raucous late-night parties, past kitschy souvenir spoons at the gift shop, down corridors dominated by shoulder pads and loud knits and into the overcrowded offices of parliamentary staff. Each photo tells a story not only about the building, but the people who worked there. This makes them a goldmine for MoAD’s curators – and, as I came to learn, the information they hold has the power to transform your experience of the building. Looking through the Last Moments slides in the MoAD bunker. Photograph by Nicole O'Dowd. The problem is, in today’s world museums don’t generally use slide projectors to tell their stories: they use exhibitions, social media and blogs like the one you’re reading. All of these require good quality digital images. So my first job was to scan each of the slides onto MoAD’s computer server in high resolution. But it’s not enough to capture the photos on their own. In order for them to be findable and useful to museum staff, we need to capture the information that goes along with each one. 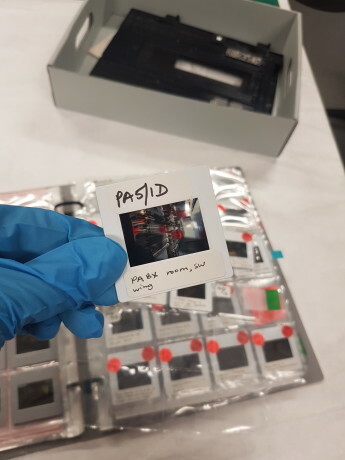 Each slide has a unique number that needs to be recorded with the scan, to link the digital item back to the physical one. Then there’s the who/what/when/where – the people, locations and activities in each photo. Some of these are easy to identify – there’s no mistaking the green upholstery of the House of Representatives Chamber – but others take a bit of detective work. A couple of us end up puzzling over a shot of a fluorescent-lit basement room filled floor to ceiling with grey electronic units, like the set of a 1970s sci-fi. I’m sitting in a meeting with curators Kate Armstrong and Campbell Rhodes. 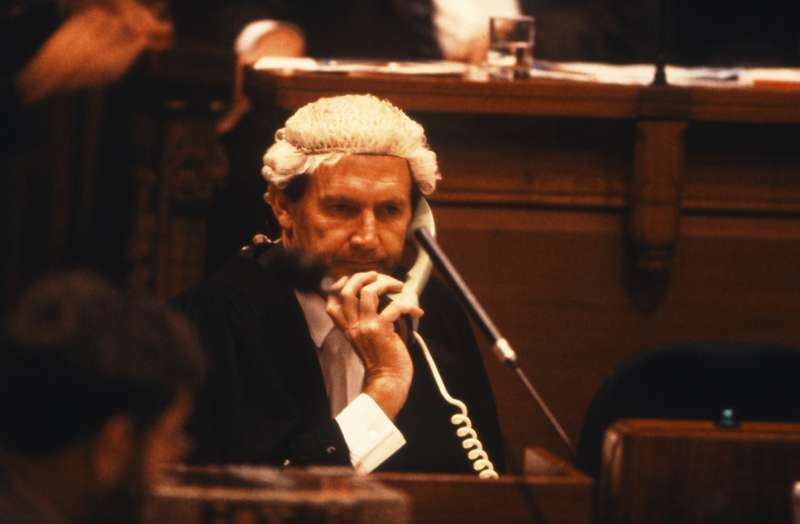 All three of us are clustered around a computer screen, which is zoomed in one of the newly-scanned Last Moments photos – a shot of a clerk taking a phone call at his desk. Kate zooms in closer on the phone. You might be wondering what the big deal is – it’s just a phone, for goodness’ sake! But this is where images like the Last Moments photos are truly vital for MoAD’s curators. One of the key ways MoAD brings Old Parliament House and its stories alive for visitors is through room recreations. Step into warren-like press gallery or the offices of the Prime Minister’s Suite and you’ll find yourself half-believing that the staff all just stepped out to lunch one day in 1988 and forgot to come back. It looks almost effortless, but in fact these things take a lot of hard work. Curators strive to make the recreations as accurate and authentic-feeling as possible, which means combing over every known scrap of information about the room and its occupants. The type of phone on a desk, the style of stationery holder, the books and papers scattered around the office, the pictures on a wall – each detail might seem pedantic on its own, but together they tell a story about a particular time, place and group of people. Nothing is better than a good photo for providing this kind of information – for capturing all those seemingly insignificant little details that can be so vital in room recreations and getting into the nitty gritty of what Old Parliament House really looked like on a working day. Having identified a list of objects from the photos, we can now search for them in MoAD’s collection records. Many of the furnishings from Old Parliament House have been carefully preserved in the museum’s heritage collection – and for those things that weren’t kept, there are often replicas to be found in MoAD’s extensive prop collection of vintage 1980s objects. Thanks to the museum’s detailed records, we quickly find our clerk’s phone: it’s an original Ericofon ‘cobra phone’ in the heritage collection - we even have a pair of 'cobra phones' on display right now in PlayUP. Erocofon 'cobra phone'. MoAD Collection. Not everything can be found in the collection, of course. In these cases, the photos are an invaluable guide for staff as they search for new additions to the props collection. Working in this way, curators are able to build wonderfully detailed recreations that transport MoAD’s visitors back to the eighties. So the next time you’re wandering through the press gallery or the PM’s suite, take a moment to explore those little details and personal touches in each room. What stories are they telling you? Jessica Curtain was an intern at the Museum of Australian Democracy at Old Parliament House while completing a Graduate Diploma of Museum Studies at Deakin University.